In Nebraska City, NE, frequent spring thunderstorms can cause moisture to build up against your home's foundation, causing cracks that let in unwanted water. Changes in the soil can also lead to foundation failure. As the soil becomes more saturated with water, it can expand, or it can be washed away. This soil movement causes settling and shifting in the foundation that rests above. To repair the foundation problems in your home, we offer several different underpinning and foundational support devices. For settlement, the solutions that we offer include steel piers and helical piers, used to support the foundation from underneath by anchoring in stable soils. Shifting foundations can be repositioned using wall plate anchors or helical tiebacks attached to basement walls. Excessive water and moisture can cause numerous problems in your home. When downspouts allow water to run off too close to your home, water collects next to your home's foundation. This water build-up causes bowing or leaning foundation walls, cracked walls and floors, or sticking windows and doors. We offer numerous basement waterproofing methods to keep water from entering your basement. Our methods include a basement drainage system, sump pump, battery backup sump pump, and waterproofing membrane. Crawl space encapsulation will keep your crawl space free of moisture and mold for years to come. 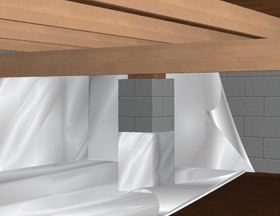 A crawl space encapsulation system varies depending on the specifics of the system, but most include overlapping the liner barriers on the walls and floor. Vapor barriers and sump pump systems for your basement are also used to reduce and eliminate moisture. Our highly-trained foundation repair contractors will take time evaluating your home's foundation and basement and recommend the most effective solution for your moisture problem. We also provide egress window installation and radon mitigation to keep your home safe. Contact us today for more information regarding our services in Nebraska City, NE.